← Manually Scheduled Summary Tasks, and how to deal with them! as you know the Magic formula is DURATION * UNITS = WORK! But there is a change in MS PROJECT in representing this field. I made a setup for this Post! I have three Tasks, each of them has one Resource assigned. 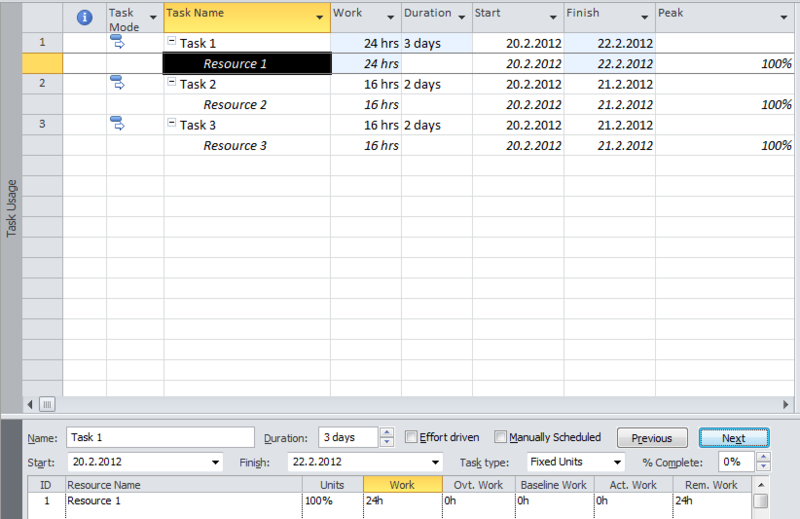 Task 1 is Fixed Unit, Task 2 is Fixed Work, and Task 3 is Fixed Duration. First I will make changes for Task 1. According to formula, Units are fixed so Duration * Units = Work, e.g. 4 days (4*8 hours per day = 100% * 32 hours). So Work is changed from 16 to 32 hours. According to formula, Units are fixed so Duration * Units = Work, e.g. Duration *100% = 24 hours = 24 hours / 8 hours per day = 3 days. So Duration is changed from 2 to 3 days. According to formula, Duration * Units = Work, e.g. 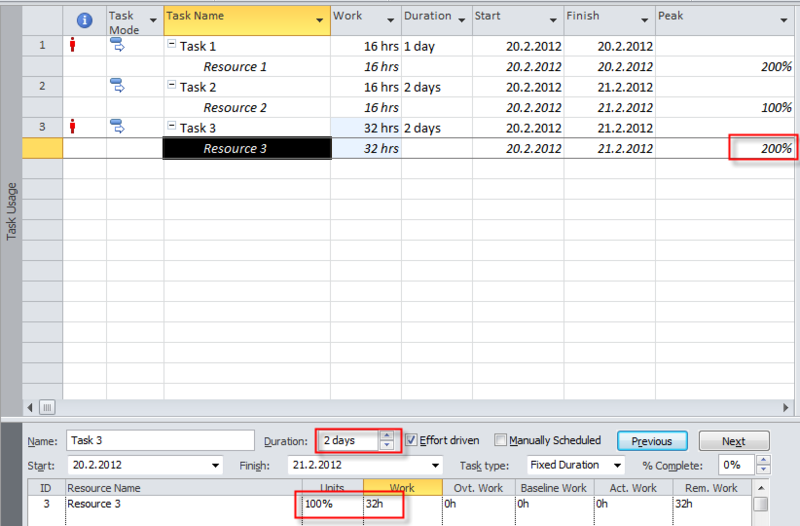 Duration * 200% = 16 hours = 16 hours / 200% = 8 hours = 1 day, because Resource will work with 200% capacity instead of 100% . So Duration is changed from 2 days to 1 day. 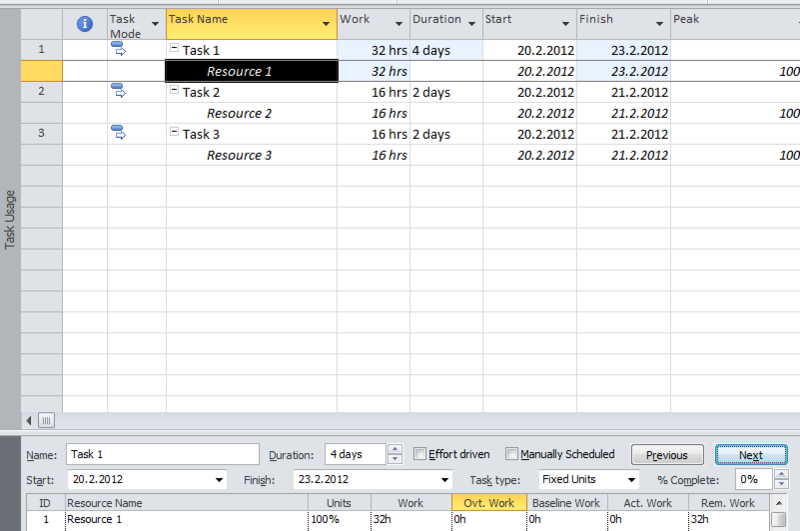 Now I will make changes for Task 2 (Fixed work). You may notice something that looks like a bug, but it is not! Duration * Units = Work. Duration = 4 days (e.g. 4 days * 8 hour per days = 32 hours). Units = 100%, work = 16 hours. So 32 hours (duration) * 100% = 16 hours! Is this a bug? NO! 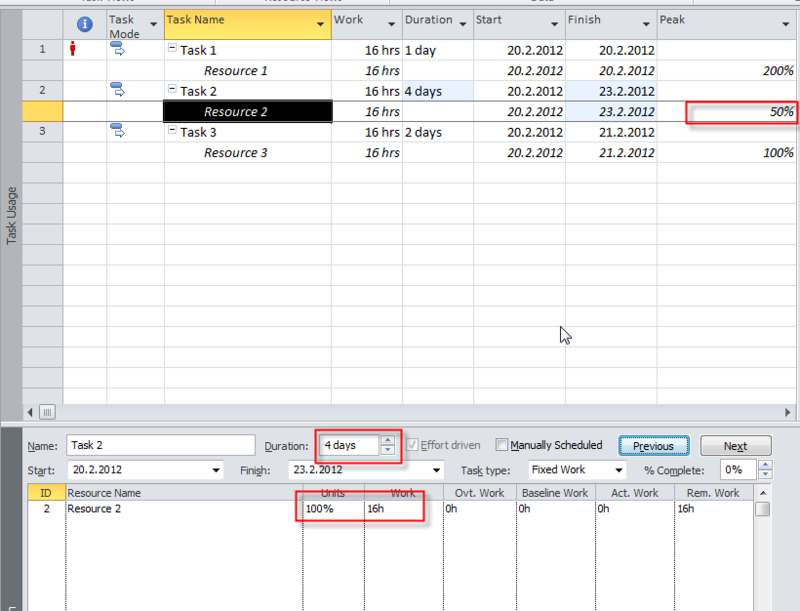 Microsoft Project 2010 keep the unit field the same, but calculates with Peak Field! Because I have fixed work (16 hours), and I put 4 days in duration field, the formula is Duration * Peak Units = Work. 4 days (4 days * 8 hours per day = 32 hours) * 50% (Peak Units) = 16 hours of work! Why is that? Because when you change duration you do not want to change Units from 100% to 50% for other Task, but just for this particular one! And that is why in MS PROJECT 2010 introduce the Peak field. Duration * Units = Work. Duration = 2 days (e.g. 2 days * 8 hour per days = 16 hours, and it is fixed). Units = 100%, Work = 32 hours. So 16 hours (duration) * 100% = 32 hours! Peak field is 200%! Because I have fixed Duration (2 days * 8 hours per day = 16 hours), and I put 32 hours in the Work field, the formula is Duration * Peak Units = Work. 2 days (2 days * 8 hours per day = 16 hours) * 200% (Peak Units) = 32 hours of work! So don’t be confused it the Unit field remains the same. Always look at the Peak field! This entry was posted in MICROSOFT PROJECT, Microsoft PRoject 2010, MS PROJECT 2010, PMI, PRoject Management and tagged Microsoft Project 2010, Micrrosoft Project 2010, MS PROJECT, MS PROJECT 2010 - Units, PMI, Project Management. Bookmark the permalink. Firstly, Thank you very much for your effort on this blog. It is very helpful for us to understand and use the MS Project effectively. Well, my comment is about the visual reports. In the subject of “budget & costs” could you please add the proper usage of visual reports, like “earned value overtime report”, “resource work availability”. Sometimes usage of these reports will make our projects more comprehensible.